I regret it as soon as it’s out of my mouth. A potentially insulting “short” joke, made to one of Canada’s favourite rock stars. 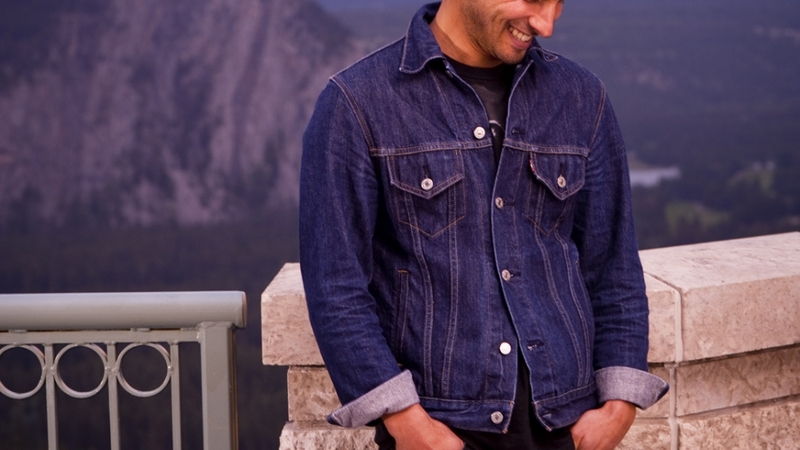 I’m standing in the doorway of a suite at the Rimrock Resort Hotel in Banff, shouting to Sam Roberts, who is out in the drizzle on a wraparound balcony overlooking the mountains. We’re here to shoot the cover of up! Magazine’s October 2012 issue. The problem(s)? It’s the end of June, it’s raining and there are only a couple of hours left until Roberts and his band take the stage for their sold-out show. So how do up!’s art staff and I, the writer, make the shot look like it was taken on a crisp fall day? It’s a challenge. Because of the rain, the lighting equipment is set up inside the hotel room with Jared Sych (our staff photographer) and I standing in the doorway, and poor Sam alone outside. The weather is putting us behind schedule, and getting Sam to open up and relax is no easy task. That’s why I’m telling jokes: to loosen him up and make him smile. It’s all in the name of getting a good photo, quickly. But then I tell the midget joke. Standing inside, I can’t even see Sam as I shout the joke out into the wind. I deliver the punch line flawlessly and then … silence. Uh oh. I poke my head out and risk ruining the shot because I’m worried I’ve offended him. But he doesn’t look offended. Instead, he’s cocking his head to one side, confused. A few minutes later I hear him crack up. He finally gets it—and we get the candid shot above. Jared used a polarizing filter to take the haze out of the sky and add some contrast to the photo. This shot was one of four, out of around 80, considered for the cover. But we went with another, partly because Sam requested not to be shown “beaming” on the cover. But this one is my favourite.